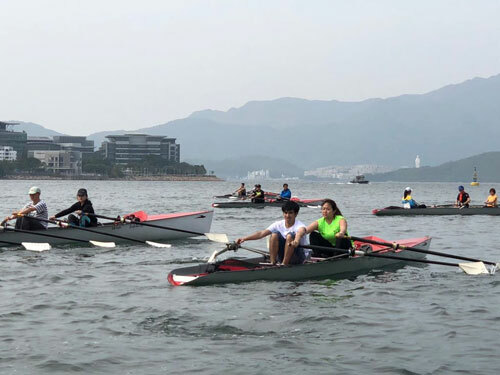 In order to promote the coastal rowing, the HKCRA launches the the coastal rowing course in all levels from elementary to advance. Taking up coastal rowing for the first time is really easy for all ages and abilities. The participants can learn coastal rowing in an interesting way which is different from the flat water rowing. Participants can learn the basic knowledge on open water rowing, sea safety and basic offshore navigation techniques sculling practice etc. Completed enrolment form, enclosed cheque made payable to “Hong Kong, China Rowing Association” (please write the name of the participant at the back of cheque) on or before two weeks prior to the commencement of the course. One cheque should serve one applicant for one course. A confirmation letter will be sent by email before the commencement of the course. Once the confirmation letter is sent, no changing course, transferring or refund will be accepted. If the course cannot be held as scheduled, HKCRA will inform those applicants by phone or email. If no notification is received in 3 days before the commencement of the course, please contact our staff for enquiry. Application will be processed on a first-come-first-served basis. Make-up class may arrange if the course is affected by inclement weather. For detailed arrangement of inclement weather, please check with HKCRA website. HKCRA reserves the right to amend all course arrangement. 2) Technical assessment will be held in the last session of Stage 1. “Proficiency Certificate” will be issued to participants who pass the skill and knowledge test. No proficiency certification can be issued by HKCRA until your attendance reached 80%. * Applicants who are qualified for Galaxy Course-Sculling Star 3 can register for Coastal Rowing Introductory Course (Stage 2) directly. “Attendance Certificate” will be issued to those who attend this course. ** Please contact our staff for arrange self-training.